Hand in has been and gone and marks have been handed back, mine were better than expected which is always good to hear. Good constructive criticism and they picked up on the points which i new were lacking too. I've been looking at the teasers we have had for next term and we've had a little project to do. We've been given Ed Rusha to look over. Who is Ed Rusha? we've been given one of his project to interpret. My mind went straight to the 9 swimming pool and a broken glass series. I've taken photos of swimming pools on my travels, i am a avid swimming for fitness and pleasure myself and have a great love of swimming pools, full or empty. A disused swimming pool is such a tragedy to me. A whole in the ground which is an empty space but once filled with water it takes on a new life, an body of energy which can be beautifully reflective when asleep and calm and energising active when disturbed by mass. My local pool which was destroyed a few years back was a 50m pool with diving boards and flume. When i use to swim there i used to imagine a killer whale being able to get through the grates at the bottom and into the dark depths of the deep end and it was deep as there was a high diving board. the whale was able to enter the tunnel from the shore line as you see the waste pipes there and swim inland through the tunnel till he got to a pool. I had a very creative imagination. it still never stopped me swimming. I always wanted to see this massive pool empty and watch it fill back up again. I've always taken pictures of swimming pools, as I travel around with my work and photography one of the first and important things I do is search for the nearest pool. I've been very lucky to work in a lot of hotels which have pools. Look at the swimming pool section for images. I made a small book for this project, i made it on photo box an online photo printing service which is mainly for commercial use not professionals but for this project it suited my budget and gives me the idea. I'll take pictures of the book and put on the swimming pool section. I enjoyed making the book and seeing it when it arrived, straight away i saw a few mistakes so if i was doing it professionally i no it would need proofing first. I'm finding this hand in very stressful. I find the contextualising and critical reflecting very hard to put into a written document to the point that i feel like giving it all up, it makes me very anxious. I know what they want me to do but my brain works very slow in processing information and i get over whelmed by the tasks at hand. I'll keep moving forward but i'm not expecting great things from this Module results as i know i haven't delivered what they want. I do worry about the written aspect of this degree. I love researching and the physical photography aspect of the work but putting it together is a mind field for me. Now i've got a better CRJ platform that i enjoy working from i think next modules CRJ will be much more fluid and done correctly and weekly. This in turn i hope will make the essays easier to manage. I've also been assigned my study support person through the DSA but i haven't been able to see her yet, i was only given her details this week and due to having Laryngitis i was unable to meet with her. Hopefully i might get a meeting with her next week just to meet up and get to know one another ready for the next module. I'm really hoping she will be able to help me with the written work as my last study skills advisor was brilliant, i had her when i studied at Falmouth university for my BA. I havent done anything to do with the the last two weeks topics in Canvas that we were given, i looked, read, watched the video and thats it. I can't think about anything else at the moment. Oh dear, i've just been going over my weekly CRJ and had a big realisation, I've wondered that far from the original idea that i'm lost and don't know where i'm going with this. I started out with nature and wildlife and now i'm looking at a man who designed gardens. This came about from my boredom in the orchard and wondering into the garden. Not focusing on the project in hand. This is also a reflection of my own personal life which i've been reflecting on. Saying that i wonder around a lot in my life with my work. Maybe i need to take the challenge to stay with one thing, place, project and focus on that instead of allow the flow to take me. Maybe i've learnt that for me thats the idea of the masters is to master that thing, not wonder off when you've just started something. To focus on that idea and master that one thing, not go off to a new area. I seem to do this a lot. Good- Bad? i have no idea i just know at the moment i'm lost with this work. maybe i need to go back to the original idea and re focus on that. I think the image are still worthy of the project as it's still in the same location at Iford manor just not of the orchard. I've had progress with the image and style and i feel like i'm growing in terms of creating narratives within the frame. I just feel like i've gone wrong somewhere. The orchard was very dormant in winter months, getting ready to bare fruit again. Maybe it wasn't stimulated enough by what i was seeing but then i should have search harder, not taken the easy route out of wondering off in another direction when things get bit boring for me. I've had a great break through this week with my CRJ. I've been struggling since having to do a crj with doing it weekly or at all. I put together my notes in my own note form but didn't publish it. I was using Wordpress and i didn't enjoy the process of using it to record my ideas and to display my journey through this masters. Having decided i needed to change it for it to work i look into other blog platforms and found Square space. This style of layout and the way its designed for us to use it suits me. I found within a few hours of using it that i was happy to be in the space and use it. It suits me. I'm hoping that this breakthrough with the CRJ will allow me to be more active in the weekly upkeep of the blog. The thought of coming into the site and using it doesn't freak me out like the other one did, i just didn't want to use it so i didn't. I feel with this kind of blog when attached to a degree program you need to be comfortable with every aspect of the design layout and ease of use that suits your abilities. I'm happy i've found mine. My project this week has taken another turn in it's development. Whilst researching Harold Peto for the garden at Iford i discovered he's designed more gardens. Peto was very much about design elements in his gardens, for example: at Iford in the loggia area which is now the ticket entrance to the garden lies a wheel of stone in the ground, in the centre of that stone is a square, "Petos' Kodak moment" stated by Mr John, the Previous owner and tour guide. "Stand on this square and you can see and capture in your minds eye the loggia to the right, straight ahead is the great stairway up to the garden and to the right the roman half circle pond, the wheel represents the iris of the lens, he wanted you to keep in your minds eye the images of the 3 things, a representation of photography"
I didn't do the oral presentation assignment, i didn't enjoy the process the first time and to be honest didn't want to address it again unless i have too. If i had my project a little more clearer in my mind then maybe i'd have attempted it but i'm still going through a new change in direction of the project and trying to figure it all out is hard enough, without adding the extra pressure of tackling a presentation too. I looked at a few of the other and they look interesting and i can see why we are asked to do it as the process would help firm the project with time to address it and change things before hand in dates. I will try and do assignments in the future wether marked or not as i can see the reason for it now.. I had my first webinar with my tutor Paul this week. He went through the other students presentations and even though i didn't do one i can still take away the advice given to those that did. This weeks shoot. I spent time in the main Italian Peto Garden. Here are the multi image shots i made from the single images above. I'm having a few camera issues, last week when my nikon broke and started using my other camera, the fuji worked but i can't find the card reader so one is being delivered shortly and the bronica multi images button has broke off so i can't use that either. Not doing to good with cameras at present but the nikon due back next week so i will be out shooting again. In the meantime i've been looking at the images so far by putting them on the wall like Steph suggested to get a better look at them. I'm finding they are getting a better narrative within them from the studying i'm doing. I'm going out now with the intent to make a image. I've noticed i don't take as many as i used to as i'm thinking more before i press the shutter. As the seasons change i'm focusing on the new growth from nature, if possible marrying that with the stone work within the garden. like this image below of new spring blossom with the roman sarcophagus of the second or third century AD. 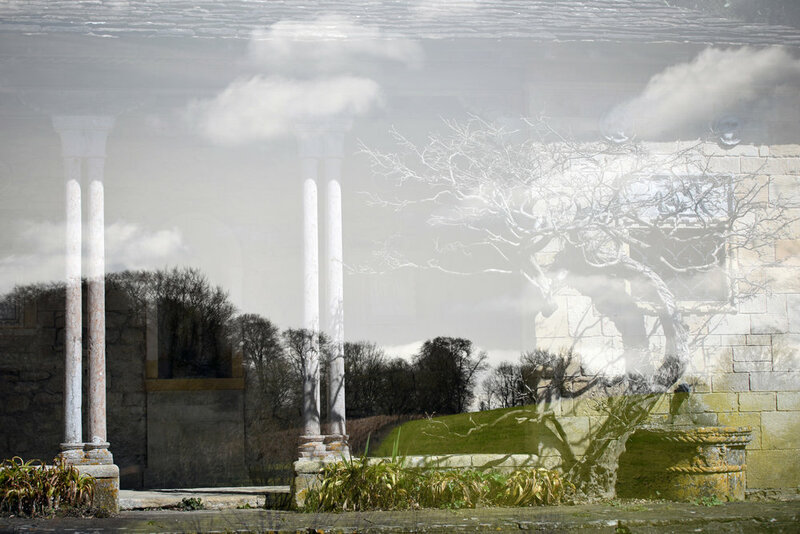 The image shows the passing of life with the sarcophagus and new growth with the blossom, i don't think the image is particularly over interesting or engaging but for me and my learning outcomes it helping me work out how to develop narratives within the frame. I find that the images are very full, sometimes messy. I dont like this look so i'm going to look for simpler composition. Below are the image i did with the fuji S3Pro that i got out of retirement. My nikon camera has broke this week and is being sent off to repairs hopefully it won't be too long till it is returned in the meantime i will get the fuji out of retirement and do the bronica images i wanted to do to see the contrast in different style from film to digital. Having moved over into the Peto Garden it got me thinking about the place as a tourist destination. I was thinking about my images and style. I don't want them to be the typical tourist image that attraction use. Current images being used by Iford. Ye wrote "that the most effective way to communicate the notion of a tourism experience at a destination is to provide visual cues that stimulate the imagination and connect with potential tourists in a personal way". The visitor is guided by the image portrait in the advertising of the place, depending on their own personal requirements that they seek out for an experience depends on whether the image will fit their requirements. Before visiting travel destinations potential visitors tend to seek communication cues to find whether the destinations fit their own tourism desire (Ye 2011). With this in mind i want to create images that step away from the tourism image and hope to create a new style of imagery that will still communicate the destination. The images above are depicting the place as seen, showing the viewer and also potential tourist/visitor what they will expect to see when visiting such place. The tourist want to know exactly what it's getting. Upon visiting the destination they will also photographically replicate the images they have already seen when choosing the destination. 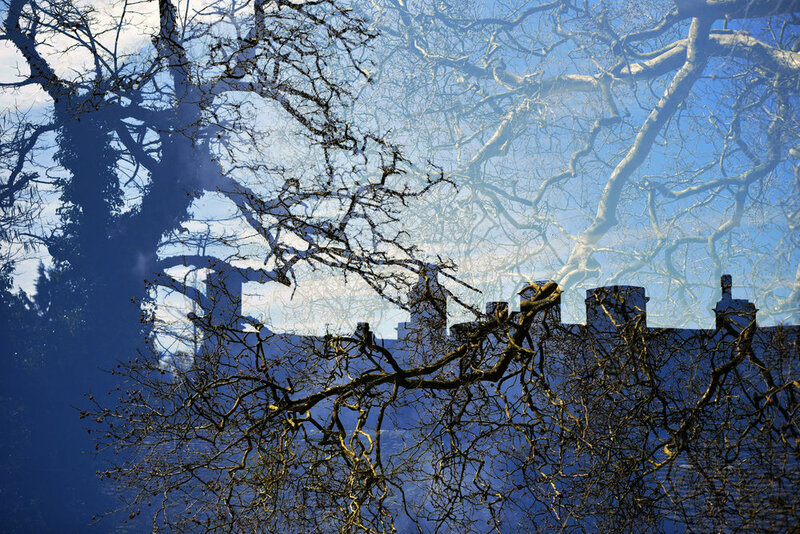 My images show the destination in a more abstract creative style, leaving the viewers imagination to work, they won't be sure as to what they will get upon visiting the destination so maybe they wouldn't work for tourism marketing purposes, but once visited and having experienced the place my images would suit souvenirs such as printed cards, cushions ,tea towels etc, the items sold in the gift shops of such tourist destinations. From last weeks wonder i become to realise and reflect that this cross over is similar to my life journey. I move around the country and abroad to find work. I moved away when i was 20 years old to work in a hotel on the coast in Torquay, Devon, and i've been on the move ever since. During this time i've documented this journey through different kinds of medium, mainly photography. I took my first picture when i was 7 at my first brownie camp.. Since then i have collections of images from my school trips, friends hanging out, holidays, school, the normal growing up lifestyle events. So i think i must have always liked to record my life. The journey I take through my paid employment allow me to venture into the landscape to conduct my study of that area. Moving myself into position slows a deeper exploration over a longer period of time. It usual starts from an-initial visit on a holiday or day trips then a burning desire to constantly re visit the area. With a end product of me moving their. This journey I have learnt is best undertaken with a certain amount of trusting the universe to deliver. Allowing the flow to happen. If the desire is what I truely need then serendipity will occur, a path is formed and the plan will fall into place. I have forced situations in the passed born out of desperation, anxiously and depression and the force I push with breaks everything and then the path is not smooth. The path needs challenges and questions but not battles or illness. It’s the wrong path. This philosophy I use in my photography. The mourning over to the garden was serendipitous, I allowed the flow to take me. This connection with the moving into the Peto garden reflects my moving and desire to record those moves around the land, my desire for pleasant places and my bordom. Ansel Adams-promotes an unspoilt hedonic view of an unspoilt western America. “Urgent concerns of the environment, what we stand to lose. Being inconspicuous and at a distance, unaware of my presence, similar to how i am in the nature world, looking at fauna and flora, at a distance but some time close up, not interfering with it. My gaze is to find out the hidden details in the land. The hidden patterns, details, tone, shapes or a scene which will engage the viewer to question the image further. I trap the land for others to see and experience it from their gaze. The world which i trap in my frame will never be the same again yet, it is free to move on to its next stage in its life cycle. I like being in the land as it calms me down, rests my mind and simulates at the same time. I’m intrigued by what i see in front of me. I get so engaged within my surroundings that all other thoughts and worries are forgotten and left behind. A mindful therapy for me and a documentation of the natural world for others to view. I’m at my most peaceful when walking the land, observing and creating photographic reproduction of that walk. 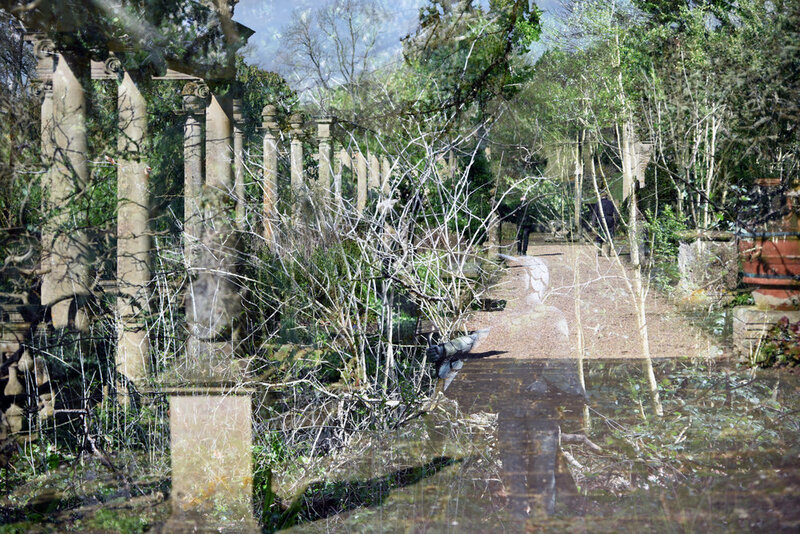 Looking at my WIP you can see the walk taking shape within the multi layered images i’m making. The layers represent the stages of the walk but mixed together with in my creativity. I’ve also recognised that i’ve strayed out of the marked area that is the apple orchard. I went for a walk into the Peto garden to talk to one of the gardens. A boundary crossed by a desire to cross it for human interaction. Whilst there i took the image of the She Wolf. The back ground image was taken in the Orchard the Front image in the Garden. I don’t want to be penned into one area, my desire for freedom and to travel won’t allow it. So i’m going to expand the boundaries and walk where i want but revisiting the orchard to see how its getting on and changing throughout the year. The walk will be fluid and not set or staged in one place, i want an organic process of walking and observation. My intentions within my images are to engage with the audience and show them the natural world. With an aim to inspire them to explore it more, to create a connection with the viewer, wether with a direct copy of the nature world or with a more abstract aesthetic interpretation of it. Natural history images are used in advertising frequently, like this image found on a website showing Creative advertising using animals. This image without the tag in the top right hand corner and the bib on the Cheetah gives the viewer a funny interpretation of it waiting for its next meal. Is that the person who would go on the trip? Could be a wildlife image taken by a wildlife photographer capturing the magnificent creature waiting to be admired. The adding of the extra elements turns it into a humorous image designed for the travel industry. Having come back to this document weeks later, i’m finding that my practice is much more than just wildlife/natural history photography and more about myself within the landscape and how i use it. I wouldn’t call myself a traditional landscape photographer as i don’t use a tripod and do long exposures to create the more traditional blurred water effect if at the coast or any water destination. Its about my footsteps into the natural world and what i focus on and see infront of me, my interpretation of the world. Research: I’m ordering Jesse Alanders book, Perspective on Place. I haven't visited the garden for a while due to bad weather stopping me getting to the location and a flu virus. Here's some images i took since being able to get back to the orchard. During this shoot my camera broke, i deleted the images which had half the image blacked out on them thinking they weren't fit to use, upon reflection i should have put them to show what had happened. The problem was the mirror kept getting stuck. I asked the Falmouth photo Whats app group if any one new how to fix it or what was causing it, they all came back with tips and ideas and Richard advised me to go to Nikon website and search in the faulty section as the D750 had a call back due to faulty parts. I did this and yeah it was part of the bad batch. Luckily for me i could send it back to get fixed for free, and thanks to Richard for pointing me in the right direction. I know now that if things gone wrong it's still best to put them in the CRJ as it's all part of it. The taxidermist technique of stuffing images, then photographing them with a painted background seemed to be a popular way of depicting nature. These image by Klaus Pichler from the natural history museum in Vienna require a second look, a constructed reality of modern interiors with taxidermist wild animals. In my practice my image is a constructed reality due to the multi image process, taking single images and blending them into one. Creating another type of environment than the one i see before me. Part of this image you instantly recognisable as a historic setting from the Italian style pillar, yet also you view the bare branches of trees indicating a winter scene, yet, it requires a second more closer look, as upon further consideration isn’t not recognisable as a normal reality but its familiar nonetheless. Nero coffee shop where i go for coffee and studying have images on the wall of traditional Italian lifestyle and culture, these images seem to be taken of people going about their daily business, a snap shot of daily Italian life, enjoy coffee, friends, laughing. Are they set up shots? I don’t know but they give the coffee drinkers in Nero a sense of joining in, being part of that Italian culture, 'We too are cosmopolitan in our coffee drinking and lifestyle’. It’s stating that we want our lifestyle to be like yours Yet, the style of the coffee house is very much the American version of the coffee house style not traditional Italian. A fusion of tradition style and cultures mixed in with modern day styling and consumer desires. As this coffee house balances two different styles so do i in my work, I balance the fact and fiction in my work by showing nature as a recognisable element, yet displayed in my work as another reality, making the viewer question the reality of what they gaze upon. In my practice as a nature photographer i want my images to portray nature as authentically as possible. I don’t want to interfere with the species and its daily life. These are my ethical and moral choices that i choose to adhere to, i have been known to move a bland of grass, leaves or twigs if they are in the way of creating a more pleasing composition, but not to the detriment of the flora. I will move instead and find a better position, i try and make the least impact can on the environment i’m in to help conserve and protect the area and wildlife. I want the viewer to see what i see but this will be changed from the view i see due to the camera, lighting, manipulation in photoshop the choice i make before hitting the button but i will not change the scene in front of me. The viewer will see my version of events, my creative eye and take on the scene in front of me. All the rules and some broken rules of how to aesthetically create and image come into play from my side of the camera. I chose to the angle, the light, composition and subject matter and when to hit the button and not to. My choices create my images. I have strong ethical and moral standing on the way we as natural history photographers take images and how or if we should bate animals into our image space, i don’t want to be tricking nature into acting a certain way or trick the viewer in what they are viewing. The way you go about your image making i guess is based on your own ethics/moral compass. Do you interfere with things to get your shot? So it makes the process easier for you? Or do you change your plans to fit in with the natural world? Depending on your choices is the image authentic or not? Images can be used in a powerful way to change the opinions of the public when used for health and or environmental issues, like the powerful health images used on cigarette packets showing the effects of cigarette smoke on our health, Similar images could be used the same way on everyday packaging showing plastic pollution in the hope that the image will motivate a change in ‘ocean friendly’ behaviour. A change campaigns or so called “Nudge' policies brought out by government using photography. So its important to show the reality of this impact as to not mislead the public. If you want to change their minds and behaviour by misleading them in the first instance is not going to win people round, if found out that it was misleading. With issues like this i believe it is vital to be truthful in text as well as the image. In my own practice i want to show the changes of the orchard and what inhabits the area as true as i can with my artist interpretation being used to create aesthetically pleasing images for viewers to enjoy. I personally want to experience nature to its fullest so i have to have the patience and determination within me to keep going to get that shot. In a lot of competition the rules state that no baiting is allowed or if so that you must state this on your image when entering. I think this is only fair. With this image by Rodriguez, In my opinion it was right for him to be stripped of his title of the wolf image. By using a tame wolf and baiting it, you know exactly where the wolf will be go and you can set up accordingly to get the shot. Any decent photographer with the right connections to a tame wolf could do it, but to create that image in the wild would take time, knowledge, patience and an understanding of the wolf’s habits etc, not only does the image then impress but it also gains recognition for the photographer who will be acknowledged for the complexity and achievement in getting the image naturally. 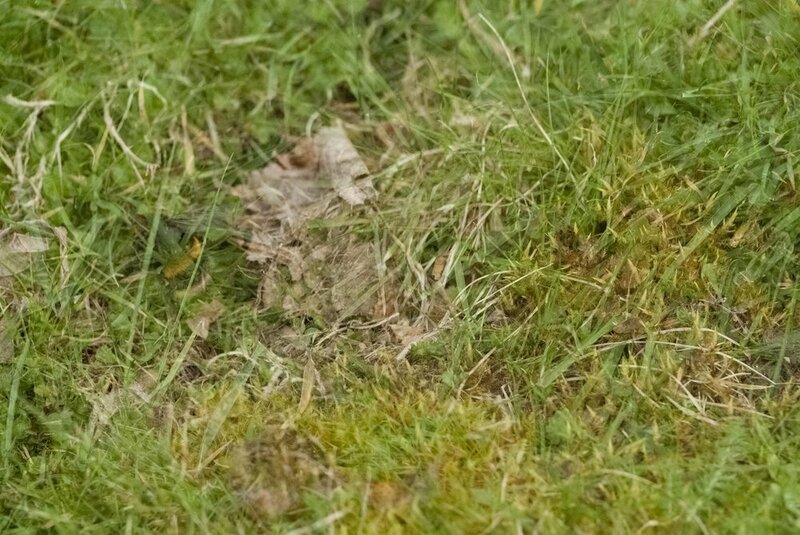 Wildlife photography has a reputation of being a hard area to work in because of the environment and nature of the subject matter so by tricking the viewer with a image thats is staged it's cheating the hard working purists out there. If stated its set up then thats fine but don’t try and pass it off as nature and authentic when it is clearly not. Yet, in wildlife film documentary i think it is acceptable to create staged set ups to document natures if its to dangerous for humans to film in the wild or if filming will endanger the subject. Explaining this process and why it has been done is also very important to allow the viewer to understand the complexity of the nature world and our limitations as human beings and film makers within the natural world environment, this then sets a standard and president for all who may possibly follow into the natural history industry or as a general interest. In my practice I’ve been recording the winter scenes in the Apple Orchard. I went out on a shoot on Sunday, I initially looked around the environment to familiarise myself with the orchard again, it’s been over 3 years since i was living and working at Iford Manor. I used to spend the evenings sitting beside the orchard taking in the warm evening light. The light at Iford is very special many have commented. Maybe it’s the place the light shines through which is special, not the light. On this mid winters January day it was a grey, drizzling and cold. The place was very quite, only the crowing pheasant could be heard loudly above other winter birds. Iford Manor is closed to the pubic at this time of year so i had the place to myself. A quick visit to Jane, a friend of mine and the current housekeeper to borrow a plastic bag to cover the camera with as i forgot to re pack the previous one I had used. Being an outdoor photography i’ve learnt to adapt with the weather, dress for the occasion and that includes dressing the camera. I had forgotten to re pack the plastic bag, high tech gadgetry at use here. With a plastic bag covering the camera, i was off to the orchard to see what was about. This was the first visit for this project, as i have changed location from when i handed in my research project proposal. The weather was not pleasant, it is winter after all. I need to embrace this, this is after all what i want to depict, A year in the life of an orchard, including good and the bad weather. At a quick glance it all looks a bit barren, at the moment the trees are in hibernation mode, shutting down for the winter, not many flowers or leaves. I’m currently reading a book about how trees communicate with each other, I've only just started this but its about how trees communicate with each other. Yes, apparently they talk to each other. Well, i’ll let you know as i read about how they do this. As i’m standing in the orchard i get to pondering about the trees and they're communicating. What are they talking about? Are they discussing how the weather is this time of year?, or how big their crops were last year? Having a joyful banter about who’s crop will be the best this year? Well, maybe thats a children’s book in the making right there…. As i wonder around i look at the space and then go further into it. I always do this, look into the big landscape as a whole then slowly, slowly go further into it, getting closer to finding the details within the landscape and the environment i’m studying. I find this requires a slowing down process, emptying the mind of everything and just being present in the moment and the space around me, a sort of meditation, becoming mindful about the surrounding area. I’m reading a book called ‘Becoming nature’ learning the language of Wild Animals and plants by Tamarack Song. This is about how we as humans have lost touch with nature and how we can rebuild that connection, again this will feed into my project as i feel it fits. I feel i need to understand nature and the subject matter i’m photographing to enable me to become a better photographer of the subject not only through the theory we are being taught on this degree about photography, but we as photographers need to know and understand our subject matter especially in wildlife and nature photography. If i’m photographing a habitat for a field guide then the image needs to be a true depiction of the species as people will be trying to identify species in the field along side written detailed text showing different elements to allow correct identification, this is very important when dealing with for example fungi, there are 5.1 million fungi species, some of which are highly poisonous if consumed by humans and one mushroom can look very similar to another mushroom that isn’t poisonous, so great care and skill is needed to correctly identify the right fungi. True depiction of the subject matter is crucial in these areas of science that use photography. In my own practice i want to allow the viewer to identify species in the orchard correct to enable a greater understanding of what lives within the environment of an Apple orchard that might not have been considered before hand, but, i also want to show the orchard off in a style thats connected to me, a more creative aesthetic approach to the photography. For example: These two images, one is a flowering tree, yet to be identified. I will spend a day with the owners who know what species of trees are in the orchard, and another old tree on the perimeter of the orchard. Again i will identify later. The first image isn’t so easily identifiable from the image, even in winter you can identify trees from their bark but this was taken at a distance so you wouldn’t be able to see it closely enough to identify it. People with years of experience would know it from a distance but i’m not that knowledgeable on tree identification in winter months. The right image is more identifiable as you can clearly see the flowers enough to be able to make a judgment if you had a field guide with you, or had the knowledge. I’m wanting to make images that hold identifying qualities as well as aesthetically pleasing and creative, i’m experimenting with the method at the moment. The image to the right is the multi image shot from the two above. I do it all on site with a few adjustments in photoshop afterwards. I do think about the composition of the images before hand and i look to see what i think will work well together within the landscape. I think this image works well with the background soft colour contrasts with the stark black silhouetted tree promenade in the foreground, allowing the subtle pastel pink flowers to show through, representing bright colourful spring pushing through dark cold winter. These multi shot image don’t work for me the composition of the of the individual images don’t work together, the bottom image looks like it shot through a piece of glass creating reflections which are unappealing and distracting, and the top image with the central snowdrops positioning isn’t good. I don’t think the colour does it any favours, all the green is a bit flat looking. The text we are reading at the moment are making me think more about the image i take in the first instance, and how the single image will bled with another, and what am i trying to depict and say within this image. What will the viewer read from viewing the image? Are the images depicting the season and capturing the essence of the apple orchard that I’m becoming to learn about. My practice is moving forwards. Profession I earn nothing from my photos, personal i enjoy it. Someone asked me the other day actually, Why are you doing the degree, Professional or hobby? I found it hard to answer this, I’m not sure. I don’t earn a living from it so i don’t class myself as a professional but i don’t think it's a hobby either. As an artist i have to create, its not something i do just for pleasure in my spare time, its been part or in me since i can remember. It's an inherent part of me. So my photography at the moment is evolving, learning, developing, growing and i don’t think the creative journey ever ends. If i don’t make money from it thats fine with me, i can earn money many different ways as i’m a skilled person in many different areas, so i don’t find i have that pressure on me, but I would like to become recognised as a photographer artist. I do find that as i’ve become more skilled in the field that if i don’t have a purpose for the image then i struggle to shoot. Why am I taking this image and how will it be used? 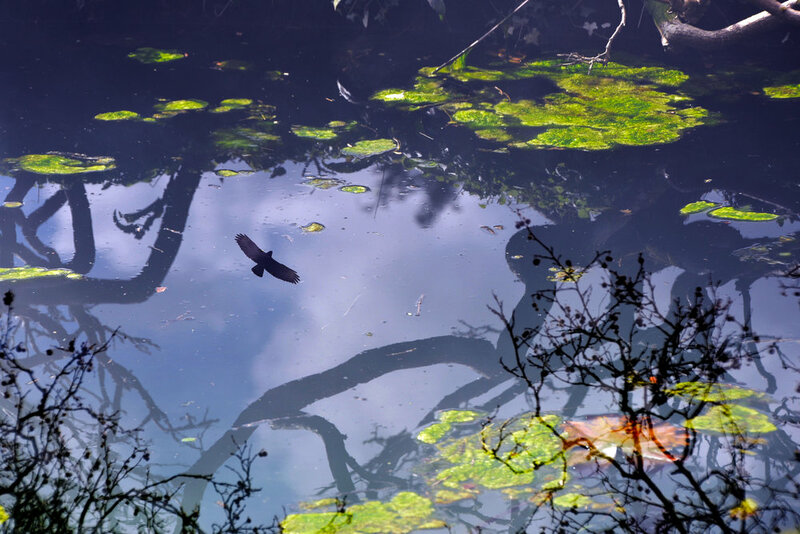 The intent of my work is to create an awareness of the nature world to wider audiences. To connect people with nature. As i learn more about the natural world i become more connected to it which in turn informs my practice. I read a lot of books to do with nature to underpin my knowledge of the subject and to help me write more creatively. which isn’t really what i’m doing but maybe i could look into this as a way of shooting outdoors. Use the natural fruit fall to recreate studio style still life. As part of my BA in Marine and Natural History photography my major project was based on water with an abstract image style. The images were printed onto fabric and made into a handmade patchwork wall hanging. Since then i have being experimenting with this style of work and intend to carry this exploration through to this major project. I have used my printed fabric to make bags made with recycled jeans and cushions. I have been exploring with the idea of having the work displayed outside for this work. By using a fabric which is water proof, or just using normal fabric and allowing the elements to turn it into something else. My aim is to create a body of work that i will be able to continue on with after this degree as a multi disciplined artist creating bodies of work but covering different topics, with the aim to sell the pieces as artwork or items that are designed pieces from a collection. My images shape shift into many different areas, they could be used for the Iford Cider advertising campaign or bottle labels, marketing. I will be working closely with the team at Iford as they will be following the progression of the project and are very keen to get involved. We all love the orchard and we all want to use it and show it off to an audience to show how wonderful these ancient orchards are, and that they should be preserved as part of our english countryside heritage. The project will be shown on the estate somewhere, this will evolve and talked about as we go along, but i’ve been thinking about maybe an outdoor exhibition shown in the Historic Peto garden which is adjacent to the Orchard, the Orchard can be seen from the Peto Garden. The garden is used frequently for photo shoots and film settings. Whilst i worked there the famous American artist and quilt maker Kaffe Fassett http://www.kaffefassett.com/ had a photo shoot for one of his quilt books. I will source this out as i can’t find it on a search at the moment. I have a copy back at home which i will dig it. But this gave me the idea of using the grounds as the exhibition space. The garden has many sculptures and art, garden features in place and the cloister is the venue for the Iford Arts Opera season http://www.ifordarts.org.uk/ so the garden is already a hub of art and inspiration. The aim is to connect different audience to new areas of art and interests. The research of this project will also go into the family history library which is already long standing, making it a historical point of interest for future generation to be informed by. My project has moved from my home address to Iford Manor, Bradford on Avon, Wiltshire.